Original design by members of the CVQG. 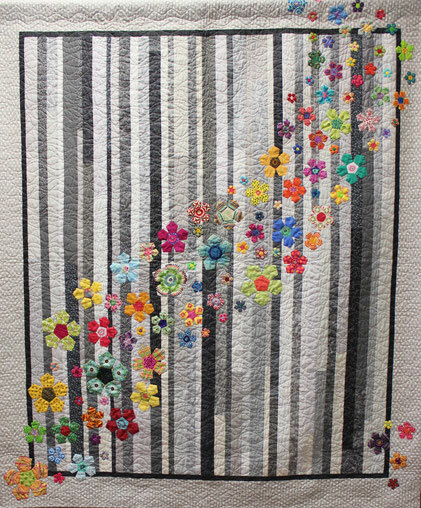 Quilted by Treese Pflum. Tickets are $1 each or 6 for $5. 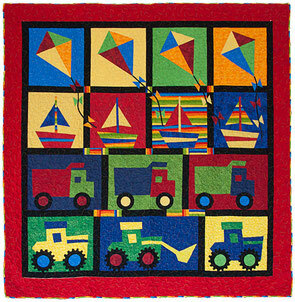 They may be purchased at guild meetings, the Date Festival or by contacting the VP Opportunity Quilts. For more information click here. 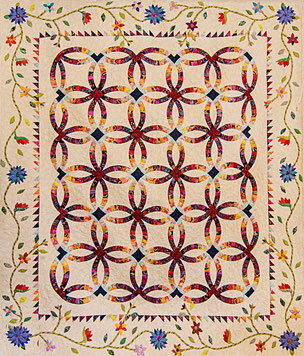 This quilt was made by guild member Natalie Shonerd from a pattern by Kim McLean. The pattern was used by permission of Glorious Color. It is 78 inches by 93 inches. 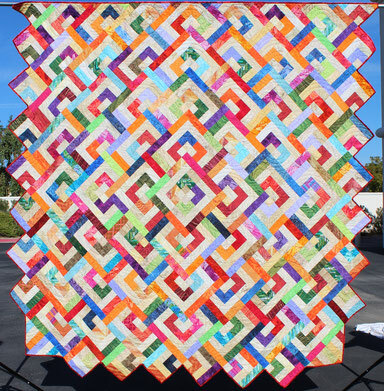 It was quilted by Karen Lummus. The winner was drawn at the guild's Holiday Luncheon on December 8, 2018. The winner was Dorothy Trethewy. She and her husband Brian live in Wenatchee, WA half the year and Cat City the other half. The winning ticket was one of six that Dorothy purchased at the Riverside County Date Festival in February 2018! "On Point Quarter Log Cabin"
It was made by the Needles and Pins Friendship Group, Shaddow Hills. 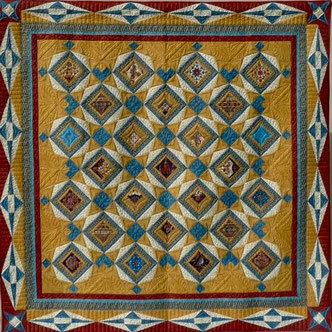 It was designed by Liz Katsuro and quilted by Mary Sue Simpson. 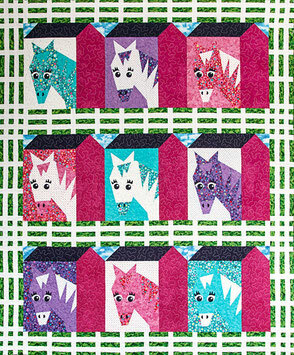 The winning ticket for this quilt was drawn at our Holiday Luncheon on December 9. 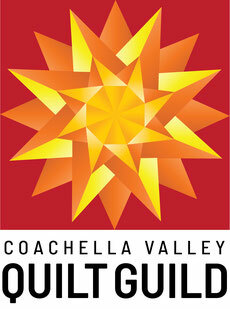 The winner was Shelly Wyman who purchased her winning ticket at the Riverside County Date Festival. 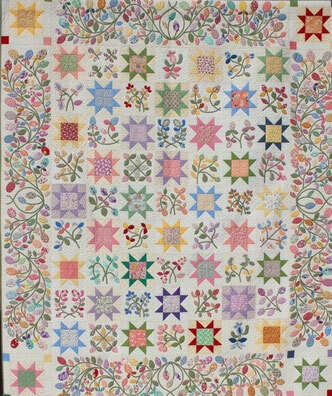 This quilt is an original design and was pieced by the guild's Star Friendship Group which includes Rebecca Blosser, Cheryl Jensen, Luella Grangaard, Connie Fleischner, and Kathleen Herring. 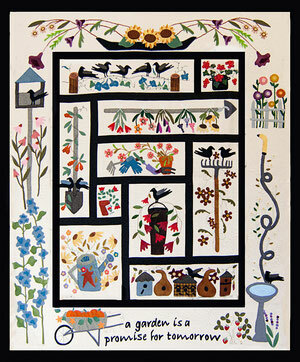 It was quilted by Debra Pugh. The winning ticket was drawn at the 2016 Holiday Brunch. The winning ticket for this quilt was drawn on December 12, 2015 at the CVQG Annual Holiday Brunch. Linda Johnson of Winnipeg, Manitoba, Canada was the lucky winner. The winning ticket for this quilt was drawn on December 14 at the CVQG Annual Holiday Brunch. Pat Kunich of Indio, California was the lucky winner. The winning ticket for this quilt was drawn on December 14 at the CVQG Annual Holiday Luncheon. Judy Dubose of Chico, California was the lucky winner.